Check out this week’s list of Need It Now deals! 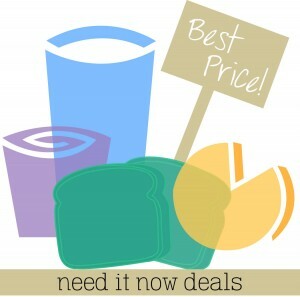 This list will help you find the best prices on the items that you use most. If you find any other great deals, leave a comment below! Publix – Georgia Sweet Corn, 33¢ ea. Publix – Mangos, $1 ea. Bi-Lo – Mangoes, $1 ea. Food Lion – Yellow and White Corn, 30¢ ea. Food Lion – Hass Avocados, 89¢ ea. Food Lion – Yellow Potatoes, 5 lb, $2.99 ea. HEB – Texas Grown Corn, 33¢ ea. HEB – Organic Romaine Lettuce, $1.48 ea. Aldi – Seedless Watermelon, $2.99 ea. Aldi – Mangoes, 49¢ ea. Harveys – Large Size Watermelons, $4.99 ea. Harveys – Cucumbers & Bell Peppers, 64¢ ea. Lowes – Green Bell Peppers, 99¢ ea. Lowes – Sweet Juicy Cantaloupe, $1.97 ea. Sweetbay – Mini Seedless Watermelons, $3 ea. Sweetbay – Limes, 25¢ ea. Sweetbay – Athena Cantaloupe, $2 ea. Whole Foods – Organic Kale, 1 bunch, $1.99 ea. Harris Teeter – Pepsi Products, 16 oz 6 pk. Lowes – 7-Up Soft Drinks, 12 pk.